Captain Richard Barnaby – Famous Sea Captain who lived on 212 N. Morris Street in 1770. The house is still standing (private residence). Jeremiah Banning (1733-1798) – Longstanding sea captain, who was appointed by President George Washington to be the Inspector of the Currency and Collector of the Port of Oxford. Robert Morris, Jr. – Financier of the American Revolution. Only man to signed the Declaration of Independence, Articles of Confederation, and the Constitution. Colonel Tench Tilghman, Served as the Aide de Campe to George Washington during the Revolutionary War. Carried the message of surrender from Yorktown to the Continental Congress in Philadelphia. Across from the cemetery, you can see Plimhimmon, home of Tench Tilghman’s widow, Anna Marie. 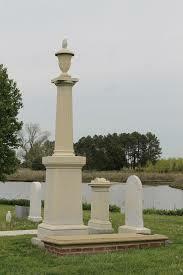 Colonel Tilghman is buried in the Oxford Cemetery, just a short walk out of town on the left. Miss Molly Stewart – Longest serving postmaster in U.S. history (63 years). 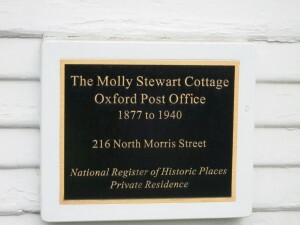 One of the most entertaining stories about Oxford involves Mary Stewart, who became Postmistress of Oxford in 1877 (at age 20) after her father, the Postmaster, died. She added a small extension onto her cottage, which served as the local Post Office. At the end of her term, in 1930, the Republican Committee of Talbot County recommended that a Republican man be appointed Postmaster, but two things were in Mary’s favor. One, she got the highest score on the Civil Service exam, while the Republican appointee flunked it. And two, newspapers of the day swept to her side, with headlines like; “Republicans Try to Kick Little Old Lady Out of Her Job.” President Hoover reconfirmed Stewart’s appointment in 1931, and she served as Postmistress until 1940. Her cottage, in private hands, is on the Historic Register.